Carrying the dough from the home to the bakehouse was a delicate task. Having risen in the warmth of the hearth, it would have to be covered with a flannel or thick cloth and carried quickly as the cold air would check its rising. Baking bread or pizza in your own wood-fired stone or brick oven is a newly discovered pleasure for enthusiasts in the western world, but it's routine for people in some countries. If they don't have an oven at home, they take their homemade dough to communal ovens or bakehouses, often following the tradition of centuries. 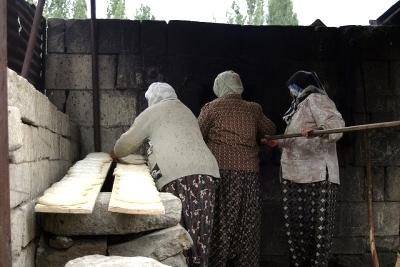 The Turkish women in the photo are making flatbreads which they will carry home on a plank of wood, leaving the oven and long-handled bread peel available for the next users. 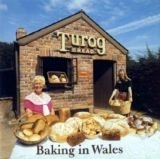 Sharing in a community oven was common in Europe for centuries. It's still widespread in the Middle East and North Africa, but died out in most of western Europe in the 20th century. You can share equally, maybe drawing lots for your turn in a village bakehouse, or pay a small fee to a professional baker to put your loaves into his oven. And you aren't limited to bread. 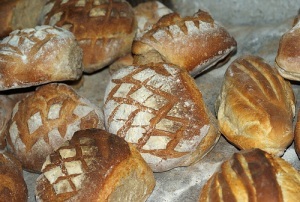 Greek bakehouses still cook Easter lamb dishes for villagers. This was once quite common in England and other countries too. Meat, pies, cakes, and other dishes for festivals and holy days used to be cooked in big bread ovens by families who normally cooked on the hearth, but could afford a few extra pennies for special meals. [In late 19th century Northamptonshire, England] people would bring along their Sunday joints on the way to church; the joints, on trays complete with the housewife's own batter puddings and potatoes for roasting, would be popped into the baker's ovens and churchgoers would collect their sizzling hunks of meat after church to carry them home again under a cloth. 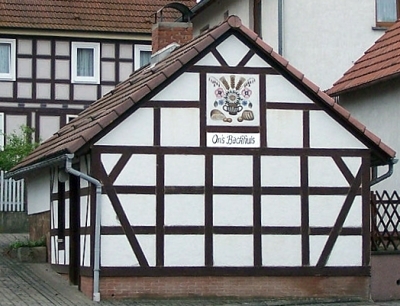 Conservation work is going on at old, crumbling bakehouses in Germany, Belgium, France and elsewhere. They may be restored to full functioning with baking days and bakery sales, or preserved by conversion into holiday cottages or other private buildings. Even when no-one local remembers actually baking in the old unrestored oven, there may be memories of the importance of the bakehouse in village life. Often they were a focal point for the community, with a central location. The bakehouse could be a place for women to socialise and exchange news. In places where a baker presided over the oven, it might be young people and children who got a chance to meet while handing in dough and picking up loaves. 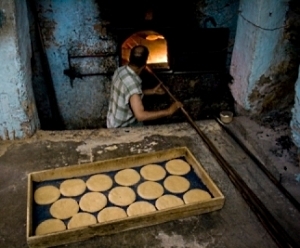 Pans of dough were marked with distinctive cuts or with metal "tallies" to make sure you got your own bread after baking. All the households in the village drew lots once a week for their baking time in the bake house and brought their bread dough, made at home, in big wooden tubs. In France many rural bakehouses were used well into the 20th century but their origins were in medieval times. Peasants then had no choice but to bake in the feudal lord's designated oven after having their grain ground into flour by the seigneur's (master's) miller, and to pay the relevant charges. The French name "four banal" reflects this. The banal or bannal laws were the regulations that kept flour and grain under the control of the feudal superior. 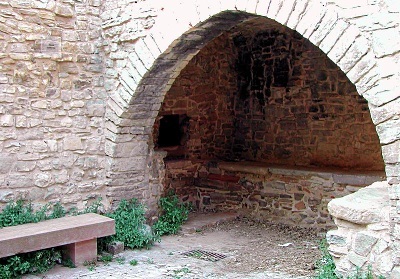 Medieval England and other parts of Europe also had "bannal mills" and "bannal ovens". Early French settlers in Canada started out with similar laws, but they didn't last - not least because a long cold trip from a frontier homestead to the nearest public oven tends to kill off the yeast in rising dough. There were some shared bake ovens in early New England settlements but the concept didn't spread through North America. 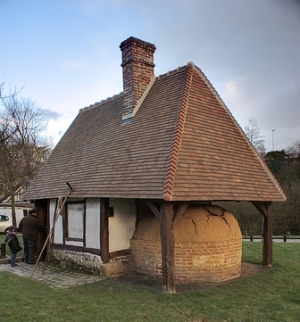 21st century Switzerland: The people of Salouf, near Savognin, still bake their bread in a communal bakehouse of this kind. It is directly on the main village square, never noticed by tourists, and forms part of the village community's public life. The good old squire hobbles out of church, leaning on the arm of his daughter, and kindly inquires after the welfare of all about him. He sends food and money to the sick and needy, makes up quarrels as a magistrate, maintains a well-ordered Sunday-school, and promotes the happiness of the villagers by every means in his power. If, on returning from church, he meets a smoking dinner going to a cottage from the village bake-house, he generally slips a shilling into the hand of the bearer, for the purpose, as he says, of washing the dinner down with a little good ale.